A proposal for a new graduate degree is initiated by the submission of the full proposal form. The steps for approval are described in the flow chart below. If you have any questions regarding the process, please contact Catherine Smith (catherine.smith@uc.edu). 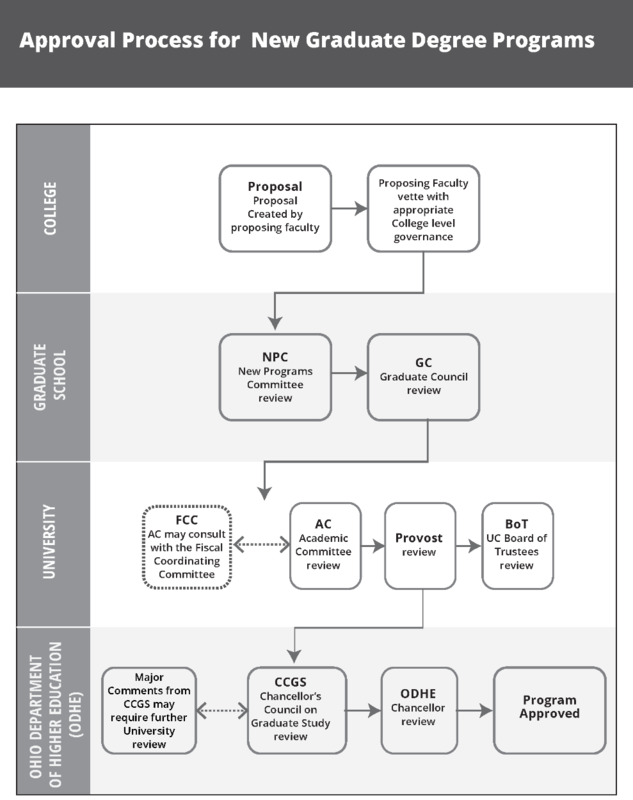 View the flowchart for the Approval Process for New Graduate Degree Programs as a PDF. After final approval is received, the submitting program faculty will complete a New Academic Program Submission form. Completed forms should be sent to Catherine Smith (ML 0097) to obtain the required signatures. The form will then be submitted to the Registrar's Office. New Academic Program Form (PDF). To view these documents, you will need Adobe Acrobat Reader, a free download.